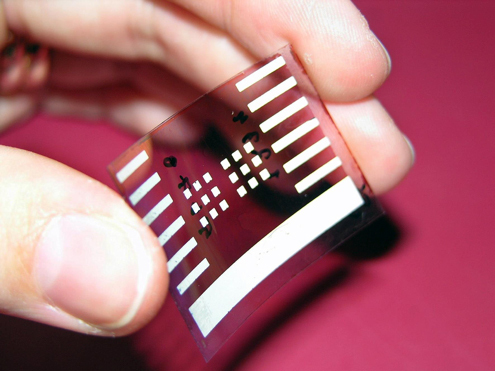 Printed Electronics – Print innovation that can change the way we live. When we think about print, we usually think about the many paper and plastic products that are obvious in the world around us. It’s doubtful that many of us think about “print electronics” but this relatively new innovation is beginning to change the way we live in unexpected ways. Print electronics are thin, flexible and transparent electronic components; manufactured by printing conductive plastic materials onto film, paper or textiles. Because they are printed, these electronic components are comparatively low cost and display unique properties that create opportunities for their introduction in novel applications. Printed electronics are already being used for solar cells, sensors, keyboards, touch displays and smart objects but this is really just the beginning of much wider commercial applications. For example, the automotive sector has already used these technologies to produce printed aerials, smart textiles that function as pressure sensors to recognise seat occupancy and to create self-dimming rearview mirrors that protect us from the almost unbearable glare of modern headlights. The medical sector is developing many novel applications that include low cost, disposable test strips that incorporate diagnostic electrodes. Other sectors are developing wallpapers that can light your entire room and intelligent food packaging that will monitor contents integrity and minimise waste. The possibilities for these innovative print components seems almost endless and whilst it may be some time before they are obvious in the world around us, it seems certain that they will change the way we live in the not too distant future.